Credit Terms are 30 days from the date of invoice. Outstanding balances are subject to 1.5% per month interest. Failure to pay entire account balance within 60 days after invoice date will result in suspension of credit privileges. 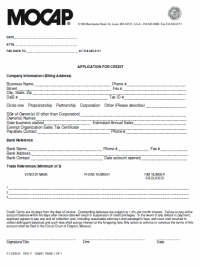 In the event of any default in payment, applicant agrees to pay any and all collection cost, including reasonable attorney’s and paralegal’s fees, and court cost incurred to collect delinquent balances and such fees shall accrue interest at the foregoing rate; Any action to enforce or construe the terms of this account shall be filed in the Circuit Court of Clayton, Missouri.